The aircraft belonged to USAAF, 8 Air Force, 306 Bomb Group, 367 Bomb Squadron and was coded GY-A. 42-3084 was hit by a fighter shortly after having delivered its bombs over the target and exploded in the air over Kiel Bay about 30 miles north of Kiel killing all onboard except one. Bombardier Lt Robert L. Alexander was blown out of the B 17 when it exploded and landed in the sea. He was picked up by Germans and was sent to Dulag Luft for quistioning. Later he was sent to Stalag Luft III Sagan and ended up in Stalag Nuremberg-Langwasser in 1945. The body of Co-pilot 2.Lt Roy Y. Padgett was found washed ashore on Dyngby beach seven kilometers east of Odder on 6/9 and was laid to rest in Fovrfelt cemetery in Esbjerg on 13/9 1943. On 30/4-1948 the body was disinterred and taken to the US Millitary Cemetery Neuville-en-Condron in Belgium. Here can also be found the grave of Navigator Lt John G. Fogarty. Pilot F/O Carl D. Brown, Top Turret Gunner T/Sgt Graham W. Diggs Jr, Right Waist Gunner Sgt James C. Seigler and Ball Turret Gunner S/Sgt Parry G. Pedersen, Left Waist Gunner S/Sgt Larry D. McCoy have no known graves and their names are found on Tablets of the Missing at Netherlands American Cemetery Margraten, Netherlands. 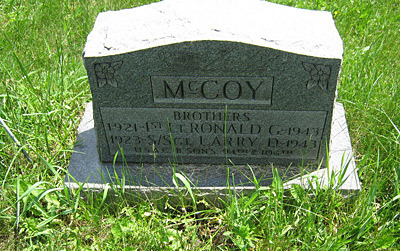 Back in the USA McCoy is commemorated on a stone together with a brother in Fort Palmer Cemetery, Ligonier Westmoreland County, Pennsylvania. Radio Operator T/Sgt Earl W. Norlen have no known grave and his name are found on Tablets of the Missing at Cambridge American Cemetery, Cambridge, England. According to some records Tail Gunner Sgt Jesse O. Wheeler rested in Aabenraa cemetery. He was disinterred after the war and brought back to USA where he rests today. Sources: FB, LBUK, BE, UA, ABMC, MACR, WW II PoW datafile, Alexander.